Japan's second best* action director Yuji Shimomura talked Tak Sakaguchi out of retirement for the ultimate action movie! Yes, yes, yes!!!! Shimomura was the action choreographer of Versus, and the director of the absolutely brilliant (and hugely underrated) Death Trance. I've been waiting forever for him to get another chance at directing. He did the short film spin off for Alien vs. Ninja, though, but I haven't seen it. * Second best because I think Kensuke Sonomura (Bushido Man, Hard Revenge Milly: Bloody Battle) might be even a tiny bit better. Great news! I'm a huge fan of DEATH TRANCE and can't wait for this! Cannot wait! Death Trance was quality! never even knew he had retired, no wonder I haven't seen a film from him for a while. wow, Romero, been a while! Trailer for Shimomura's new short film Hero (2015, 29 min), starring Masanori Mimoto (the lead actor of Alien vs. Ninja and the yakuza knife master in Bushido Man) and Tak Sakaguchi. Premiers at Yubari next month. It's a part of an episode film called Jikan souzou bu (時間創造部), which doesn't look too good but Shimomura's episode is certainly of some interest. That's Makoto Sakaguchi from Tokyo Tribe, btw. Karate Kill also premiers there. It has been a turbulent few years for longtime festival favorite Tak Sakaguchi. After exploding onto the scene as the star of Ryuhei Kitamura’s VERSUS back in 2000, Sakaguchi has been one of the go-to action stars and fight choreographers in Japan, with a loyal cadre of fans all around the globe. But Takaguchi’s career nearly came to a screeching halt in early 2014 when a bitter business dispute forced him into pseudo-retirement; he halted all appearances in front of the camera and was forced to do his continuing work as action choreographer on Sion Sono’s TAG and TOKYO TRIBE under a pseudonym. 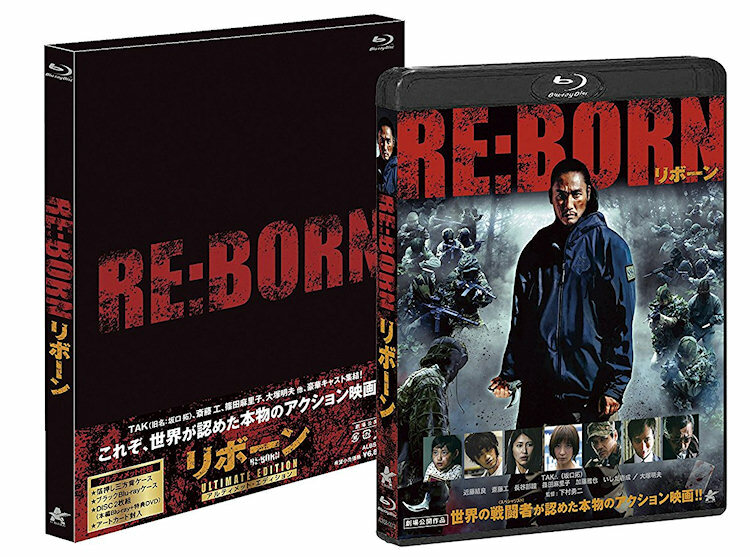 But with RE: BORN, Tak is back and he’s bringing erstwhile collaborator Yuji Shimomura (director of DEATH TRANCE) with him. When an entire squad of Japanese Defense Force soldiers are cut down during a training exercise, it appears the worst is true: the Ghost, a legendary covert operative, has seemingly come back and set his targets on the force that used and abandoned him. His old comrade is now living a quiet life and trying to simply slip by unnoticed as he raises the young girl in his care, but must return to the world he abandoned to stop his former friend turned enemy. Sounds quite promising and I have missed until now that Kenji Kawaii did the music for this film. That's another reason to look forward to it. It took a while, but I finally got to see the film. There's a great sense of disappointment when a film is so keen on its original concept that it forgets some of the basics of action filmmaking. The film sees Tak Sakaguchi as a former special forces man, now running a convenience store in a small town, caught up by his past when former colleagues comes after his life. 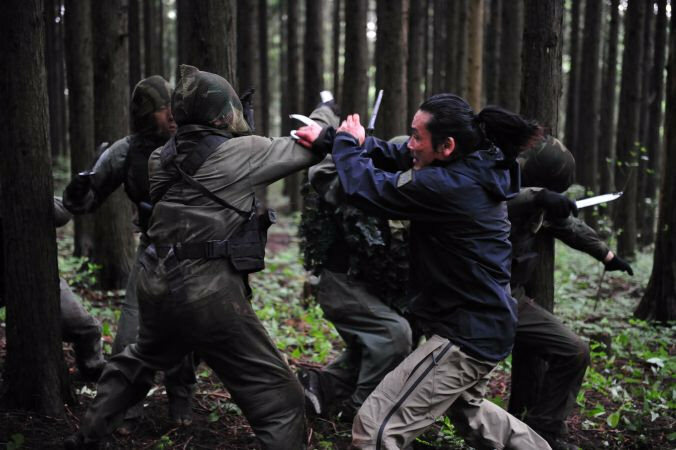 The film's selling point is the so called Zero Range Combat System, developed by combat strategist Yoshitaka Inagawa, who seems to have impressed the filmmakers to the extent that they couldn't see the forest for the trees. Too often character motivations are left vague, and we don't know how exactly their combat strategies are supposed to work. With too much shaky camerawork, close-ups and edits that fails to convey micro-level continuity in the fights, the film turns into a mechanical showcase of fast moves. Ironically enough, the film inserts a good 45 minutes of mostly unnecessary back-story when all they needed to do was to make it very clear what's going in each scene. There's still, thankfully, a decent amount of fun to be had with some cool details in terms of the main character's characterization, and of course the action (I may be too critical considering films like The Raid and John Wick 2 suffer from similar technical irritations, yet people seem to enjoy them very much). But as far as recent Japanese action cinema goes, there have been more dynamic efforts at filming action by the likes of Kensuke Sonomura & Takanori Tsujimoto (Hard Revenge Milly: Bloody Battle, Bushido Man). Perhaps I'll be more forgiving the next time I see the film. 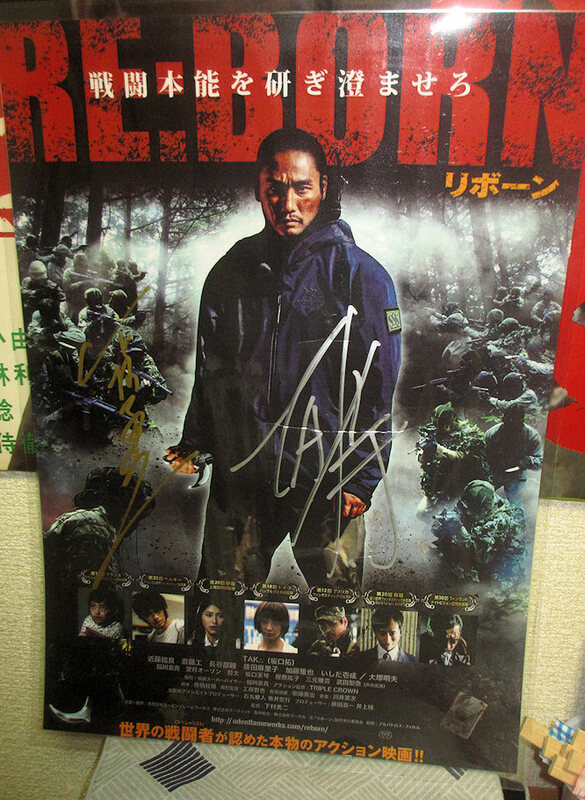 I won a mini-poster signed by Sakaguchi and Shimomura, btw. Shimomura had been to the theatre the previous day and left some stuff to give away.